Weeds, apparantly! That's what we community gardeners are. Burrowing down relentlessly, finding that little crack in the asphalt, sending down roots, determined and resolute. Unwavering in our resolve to spread the word, grow the plants and be a community. Words of wisdom from a famous garden guru, Costa, who came to our fair town last week to be part of the launching of local PlaceStories. Ms Tagalong must slap her hand for that hubris of a rising blush at seeing the home page of this little blog up on the big screen. How wonderfully exciting. Who needs thousands of followers in cyberspace? Here it was being displayed and featured for all to see on the website. And of course, more blushes, in front of Costa! What a thrill, what a celebrity to come and give an impromptu talk on communities and what they mean. He seemed determined to come back to Newcastle and see some of these wonderful sites and by the end of the night, Ms Mova, Ms Designer, Paint Pot Pat and Ms Tagalong had developed a whole itinerary for him to visit in our wonderful community. Perhaps he should have stayed for the Christmas spirit and the elves' visit together with the heavenly choir who performed last Friday night. What a treat, even the tone deaf Ms Tagalong sangalong. Later in the week, welcome rain washed the ground and refreshed the plants and seedlings hopefully planted by Mr Ideasman. He is patiently waiting for beetroot and according to Ms Tagalong he will be waiting a long time. The newly acquired sowing times and moon phases show that this is not a summer planting crop! The enthusiasm, the ideas! he's not called Mr Ideasman for nothing! So off we trot exploring pastures new for the holidays. Ms Tagalong is determined to visit some other gardens along the way, to describe them and provide photos for your delectation. She does, however beg your indulgence, as the wonderful, long-promised broadband coverage does not yet extend to all of our fair land and especially to the wonderful, wild National Park areas Ms Tagalong and Mr Ideasman intend to visit. Be patient. And anyway all of you will be enjoying the festive season, carousing and carolling and not be looking at blogs! 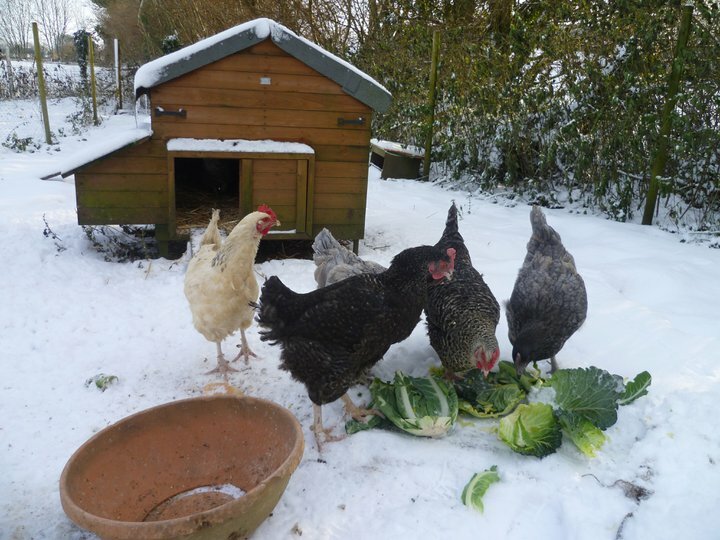 Don't neglect the chickens or the plants though! They will be crying out to me if hungry or wilting! Oh no, not again, I hear you say. Well, after Ms Tagalong's wonderful planting out of the rhubarb and Ms Mova's careful shade sail over the top, Ms Tagalong noticed in the hot chicken day afternoon that the Western sun rampaged over the garden under the sail right into rhubarb corner! One crown from the original plants at the other end of the garden next to the hopeful asparagus bed has been shooting up beautifully. So location, location, location Ms Tagalong and Mr Ideasman carefully transplanted four of the plants to their new location next to the other which is shielded from the afternoon sun and on the makeshift compost pile. Note: Watch what plants like where! Ms Tagalong and Ms Mova were away this weekend for the working bee and breathlessly waited to see if any garden elves had crept into the garden whilst they were away and worked through the job list so beautifully written on the blackboard. Weeding and watering, tick. Mulch alongside the outer fence to increase chicken proofing, tick. Three new mulberry plants planted outside on the verge for our food forest, many ticks! We will need to plan now what else can be planted underneath. Meanwhile the council continues to mow as long as the trees are staked. You might be pleased to know that the salvinia has well and truly dessicated on the concrete where it was unceremoniously thrown last weekend. To replace this a fellow community gardener brought us some watercress . Ms Tagalong thinks it is a special one but can't recall the name so if anyone can identify it from the photo please let me know. Apparantly it should soon colonise the bathtub and provide some good fodder. Corn, as you probably know, should be picked once the tassels have turned brown and are easily taken off. Testing a few, Ms Tagalong started salivating, thinking of golden corn roasted on the barbeque with dripping butter and parsley. Tearing off the husks, she was extremely disappointed to find that only a few of the kernels had matured, not enough to eat for us but the chickens thought they were great! Ms Tagalong was busy this morning doing domestic goddess tasks and stepped out onto the back verandah and was halted in her tracks. Dulcet tones drifted from the garden, or was it a CD played next door to get us into the season? No, it was the local choir practising for their second performance this year, Carols by Candlight in our community garden. Yet another prestigious event in our prestigious location. Ms Mova has some chicken friends in England and they wanted our little darlings to stop being so greedy and be grateful for what they have. They sent us over this photo which Ms Mova intends to enlarge and place on the fence when they are cheeky! As Ms Tagalong trundled the seventh, or was it eighth, barrowload of dessicated fig leaves and the odd shovel of moist, decaying vegetation she mused on how clever nature was and how we just don't seem to work with it. The avenue of giant Port Jackson figs which line the street outside the community garden provide a year round supply of leaf litter to be directly placed on the garden to be turned into the soil, as a mulch or a good layer for the compost heap. Unfortunately most of them are swirled around by the wind on the tarmaced road or sluished down the drains and into the creek. What a waste! Be vigilant fellow gardeners, sweep up those leaves and turn them into black gold. The compost heap Ms Tagalong made yesterday may not fully comply with the recommended structure but went a good way to utilise all our on site ingredients. Some of the existing mulch and horse manure and sawdust was laid down first, then the scrapings from the chicken huts,(straw and the topmost layer of earth under their boxes) leaves, wet newspaper from the bathtub, former home to the noxious salvinia, more leaves and mulch from the mulch heap on top. Reading the advice, Ms Tagalong thinks she probably should have found some more nitrogen sources but hey, you mulch and learn. Yes, be aware and know that you are not on your own. There is a COMPOST AWARE WEEK! this was for 2008 but I challenge you to find out more and report back to the blog what you have found out. Imagine a whole street, nay a whole suburb composting together! This is what community is all about! Or is it about brunching together. Those purists of you might not like the reporting of this community event held in a local park. But Ms Tagalong is so proud of one of our gardeners who organised it. The big brunch that is, long tables full of locals eating and sharing together. Apparantly we are going to involve produce from the garden next year more than the indirect contributions from the chickens, that is. The chickens are being set to work and have been put into the tractor after now getting used to its presence for a few months. Yes, they were accustomed. Mr Ideasman lifted it up and Ms Tagalong popped in the chickens. Chicken number 1 looked around, scratched half-heartedly and then squeezed through the wire! Attempt 2, Ms Tagalong spied a much fatter one and popped her in. Happily we left two plump chickens scratching on the fallow bed. Half an hour later they were both loving the whole garden. Ah well, more chicken wire over the bottom of the tractor I feel. And even more. We showed a film in the garden last night, nothing better than sitting in the gentle summer air, swatting mosquitoes, trying to concentrate on the dark dialogue in Atonement.